Recently Atomhawk added Linux as a stretch goal for their crowdfunded point and click adventure The Realm. I've been discussing with them the notion of proritising Linux support sooner, and they've put together a survey to gauge interest. When I first spotted the pitch video for The Realm, a point and click adventure game that Atomhawk and Lantern Interactive currently have a Kickstarter campaign running for, I was quite taken in. 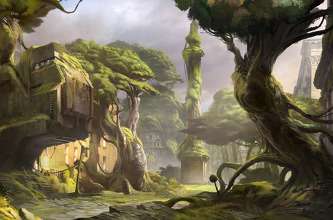 Their painterly artwork they're currently working with looks beautiful, as does the Miazaki inspired setting and story. I'll be updating this post with a deeper description of the game soon, but for now, I'd like to ask for everybody's help in highlighting how important Linux support is to our readers by filling out this survey that the developers have put together. Vote for Linux and we'll see if together, we can get native support pulled ahead of the £300k stretch goal. Update: They are doing a Linux version! Quote Thanks to all of you who answered our poll. We've had a lot of conversations with Linux users and there was a strong feeling that Linux shouldn't be a stretch goal. So we decided - we are going to do The Realm on Linux together with the Windows and Mac version as part of our normal release! I hate it when poll results aren't public. Sounds great though. liamdawe I hate it when poll results aren't public. Sounds great though. Normally, I'd agree with that, but I've too often seen non-Linux backers of crowdfunding projects claim that Linux support is a waste of resources and start begging developers to not support it. In this case, I think it's for the best that results aren't made available prior to any decisions being made (I will ask them if they'll make the results available after any outcomes have been decided upon, though). Edit: Somebody beat me to updating the thread! An announcement has been made regarding Linux support.